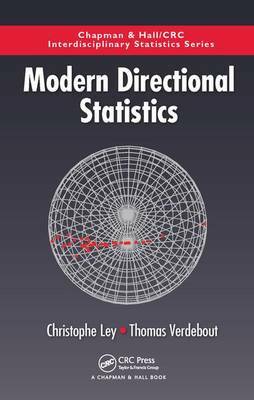 Modern Directional Statistics collects important advances in methodology and theory for directional statistics over the last two decades. It provides a detailed overview and analysis of recent results that can help both researchers and practitioners. Knowledge of multivariate statistics eases the reading but is not mandatory. The field of directional statistics has received a lot of attention over the past two decades, due to new demands from domains such as life sciences or machine learning, to the availability of massive data sets requiring adapted statistical techniques, and to technological advances. This book covers important progresses in distribution theory,high-dimensional statistics, kernel density estimation, efficient inference on directional supports, and computational and graphical methods. Christophe Ley is professor of mathematical statistics at Ghent University. His research interests include semi-parametrically efficient inference, flexible modeling, directional statistics and the study of asymptotic approximations via Stein's Method. His achievements include the Marie-Jeanne Laurent-Duhamel prize of the Societe Francaise de Statistique and an elected membership at the International Statistical Institute. He is associate editor for the journals Computational Statistics & Data Analysis and Econometrics and Statistics. Thomas Verdebout is professor of mathematical statistics at Universite libre de Bruxelles (ULB). His main research interests are semi-parametric statistics, high- dimensional statistics, directional statistics and rank-based procedures. He has won an annual prize of the Belgian Academy of Sciences and is an elected member of the International Statistical Institute. He is associate editor for the journals Statistics and Probability Letters and Journal of Multivariate Analysis.